LEGEND has it, more than 400 years ago in a sparsely populated region of what is now southern Bolivia, Diego Huallpa, a young Quechua man, lit a fire at the base of a mountain to ward off the bitter cold. When he awoke the next morning, a trickle of molten silver had bubbled out of the ground beneath his fire. He tried – and failed – to keep his discovery from the Spanish conquistadors. In 1545, they claimed the mountain, christened it Cerro Rico (“Rich Hill”), and built the town of Potosí at its foot. Within 50 years, Cerro Rico had become the most productive silver mine in the world, and Potosí one of the largest and wealthiest cities in the Spanish empire. Over two centuries, miners removed 45,000 tons of silver from the mountain – 200 times the weight of the Statue of Liberty, and about 5 percent of all the silver in existence today. Most of it was stamped into Spanish dollars, or “pieces of eight,” which spread throughout Europe, Asia, Africa, and the Americas, becoming the world’s first global currency. The coins were legal tender in the United States until the mid-1800s. By the time the Spanish had left, most of the silver was gone and millions of slave workers had died in the mines, which had been honeycombed with unstable tunnels that collapsed and entombed the miners. Despite losing hundreds of feet, “the mountain that eats men,” as it became known, still looms over Potosí – which now ranks as one of the most polluted places on earth. That changed when University of Oklahoma researchers, working with the government and private sector, installed a passive treatment system that uses gravity to route contaminated groundwater through organic material and limestone gravel. The water, discharged from old mining boreholes, travels through several stages. Once clean, it flows into a tributary of Tar Creek. Nairn tells Cooper that the system is working in Oklahoma, and that the team is trying out the technology in a smaller, pilot system near another severely polluted area: Potosí. He introduces Cooper to one of his most promising PhD students, Bill Strosnider, who is leading the research in Bolivia. STROSNIDER visited Potosí for the first time in 2003, as a college student. He was volunteering with a nonprofit that designed fuel-efficient stoves for locals, but he never forgot his first glimpse of the town’s river. “Under the bridge in Potosí, the water looked like a strawberry garbage milkshake,” he says. The image struck him. Strosnider, now 33, grew up in Pittsburgh’s Monongahela Valley, an area of heavy industry. He often played in the stream near his house, only to learn later that an abandoned coal mine had polluted it. 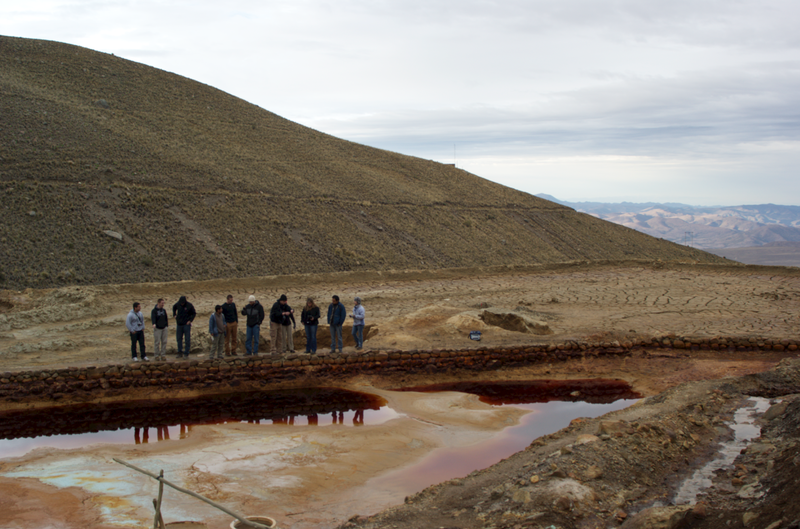 While working toward his PhD in environmental engineering, Strosnider returned to Potosí and spent a month sampling water downstream of mines throughout the region. Some of the water near the city registered nearly 0 on the pH scale. (Anything over 7, such as baking soda, is basic. Anything under 7 is acidic. Hot sauce is around 4; vinegar is 3.) As he researched acid mine drainage – the source of pollution in Potosí – he learned that the rock in the mountains of Bolivia (and in many U.S. mining regions) is full of naturally occurring lead, cadmium, arsenic, and other heavy metals that are harmful to human health. They pose no threat until miners expose new rock and hit the water table. When water and air meet the freshly cut rock, the water becomes acidic, and as it runs downhill, the acid water dissolves these metals into a toxic slurry. “I couldn’t believe the concentrations of heavy metals,” Strosnider recalls. “When I ran the samples, I found arsenic, but also cadmium, chromium, cobalt, lead, nickel – so many toxic metals in these acid mine drainage sources, it just blew me away.” The arsenic in some places he sampled was 100,000 times higher than the legal limit in the United States. His Bolivian research partner, Freddy Llanos, a professor of mining engineering at Tomás Frías University in Potosí and the owner of a small mine that operates without hitting the water table, was less surprised by the findings. He had seen firsthand the effects of the toxic water – stunted fruit trees, water that burns the tongue, wetlands scorched by the acidity. In an area of such widespread pollution, the men searched for a site big enough to implement a passive treatment system, but small enough to manage. The Juckucha Valley would work. Even better, Strosnider knew a mine-owner there who was willing to team up with them.